Visiting a hair salon is one of life’s most indulgent pleasures. 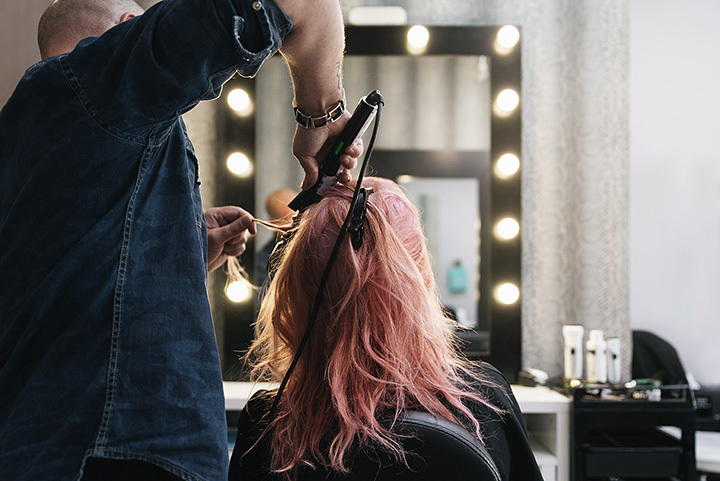 Of course, most of us make a point of getting our hair cut, but there’s a difference between getting a haircut and experiencing the luxuries of a top-notch salon. For options with good vibes, expert stylists, and an array of services, check out our favorite salons in Utah. Located in the Shops at Riverwoods in Provo, Salon K is a top Utah salon that is home to an impressive number of sought-after hairstylists. The salon exclusively uses Bumble and Bumble products, and it’s worth every penny. Conveniently located on Highland Drive in Salt Lake City, b Space Salon offers a range of standard hair services, spa services, and nail services. With trusted hairstylists and aestheticians, the salon has a positive reputation in Salt Lake Valley, and is popular with both younger and older crowds. Shep Studio is a clean, modern salon that emphasizes the creative and architectural aspects of hair. But don’t let that scare you if you’re only looking for a classic cut, because the stylists at this salon can do it all. With fair prices and an inviting ambience, this is a salon worth investigating, and arguably the most popular salon in Provo. Lunatic Fringe is a Utah salon staple. With seven locations in Utah and a wildly large and loyal following, the salon has made a name for itself since its founding in 1999. Lunatic Fringe is very invested in maintaining a familial atmosphere where stylists can find opportunities to exercise their artistry. Even though its name suggests otherwise, this is a salon you can trust. Salon O touts itself as a traditional salon that specializes in both contemporary and classic styles. The salon’s interior is uniform and calming—cleanliness and salon organization are a non-issue at Salon O, given the salon’s 24/7 impeccable condition. All of the salon’s hairdressers are experienced and professional, so you won’t have trouble finding one to fulfill your long-term, hair-related needs. So it’s true: the service at Salon 21 is phenomenal. The salon’s staff and stylists are incredibly friendly and attentive, which is always a plus. So in addition to great hair, you’ll come away from Salon 21 with a great feeling. Who can beat that? Even if you have a typically low-maintenance haircare routine, James & Runyan is one of those salons that makes you want to take better care of your hair. And when you come away with a cut from one of the salon’s fantastic stylists, you’ll have the motivation to uphold those haircare resolutions. The Tallulah East Collective feels fancy. And that’s because it is. It could be the salon’s enticing array of succulents or its beautiful interior, but this salon’s level of luxury is also manifest in the quality of its services. If you want a haircut that feels up-to-date and fresh, the Tallulah East Collective could be your new favorite salon. You can get your hair done at Rose + Water Beauty Bar and feel like your very own celebrity walking the streets of the Sundance Film Festival. Rose + Water Beauty Bar will have you feeling so good, there’s no way you aren’t Instagramming a selfie of the results. Aspen Salon takes everything back to the basics in the very best way. This place is for picky perfectionists who don’t want to break the bank, because not only will you emerge from the salon satisfied, but you’ll be happy about the reasonable price you paid for an above-and-beyond haircut.